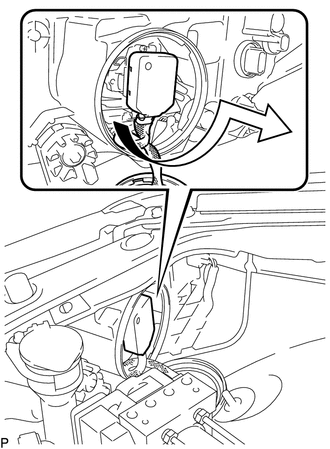 After turning the ignition switch off, waiting time may be required before disconnecting the cable from the negative (-) battery terminal. 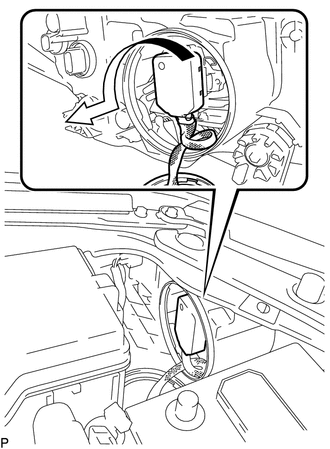 Therefore, make sure to read the disconnecting the cable from the negative (-) battery terminal notices before proceeding with work (See page ). The light control ECU may be hot when the light control switch is in the HEAD position or right after it is turned off. Check that the light control ECU is not hot before starting work. 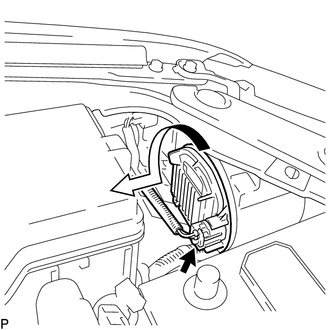 (b) Turn the light control ECU in the direction indicated by the arrow shown in the illustration, and disconnect it. Do not apply excessive force using a tool. Do not damage the O-ring or allow it to become contaminated with foreign matter. If the O-ring is damaged or contaminated, water may get into the headlight assembly, resulting in a malfunction of the light control ECU. 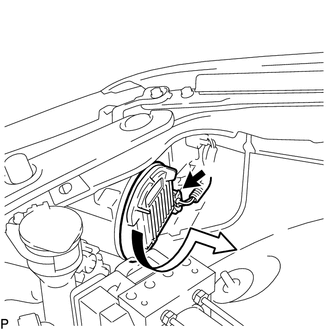 (c) Turn the socket of the light control ECU in the direction indicated by the arrow shown in the illustration, and remove it. Do not pull the light control ECU with the socket connected. Use the same procedure for the RH side and LH side (See page ).